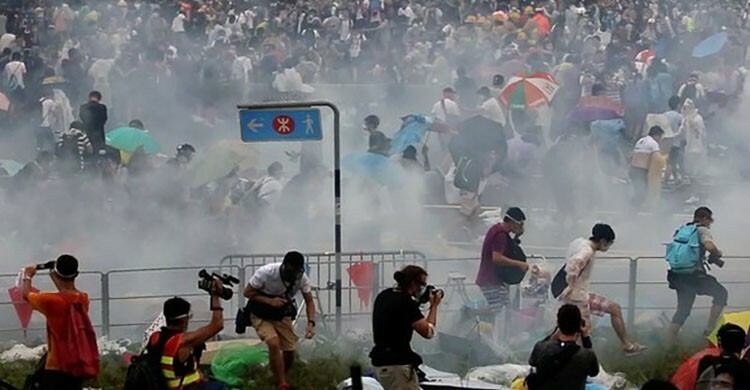 Occupy Central Protests in Hong Kong an Ideal Guide for Chinese Parenting - AiYa! 哎吔! For those who are following the protests by Hong Kong students and other pro-democracy demonstrators against the Chinese government, you should recognize this is a perfect example of how Chinese parents deal with any rebellious youth. The cries for sovereignty and the pleas to choose their own leaders are not unlike a child acting against their parents’ best interests. Hong Kong: We want ice cream! China: You finish your vegetables! Hong Kong: We want to pick our own vegetables! China: We’ve given you the vegetables we want you to eat! You eat them! Hong Kong: We want government representation that understands our interests and that we choose ourselves! Parents should never ever give in. After all, first it’s ice cream. Then it’s the right to elect an entire parliament. Then they’ll want to move out with their boyfriend. Then it’s secession from Communist China. China won back Hong Kong from the United Kingdom fair and square via a 99-year contractual obligation. All the Brits did was build a world-class economy, social infrastructure including safety regulations, health services and education, elite mass transportation, and one of the most open-trade ports in the world. Without those, China would have gotten around to fixing Hong Kong… probably maybe. But seriously, these protests need to stop. There is no winning against the Chinese government. They are the ultimate parent and will threaten their kids – not by sending them to their rooms without food – but by tear-gassing them, rounding them up and arresting them. Estimates are 1 to 7 million people died during the Cultural Revolution under Mao Zedong. Does China care? No one ever actually bothered counting the actual dead. Like I’ve said many times, a country that can make a billion people doesn’t sweat it to lose a few. There are 7 million people in Hong Kong. The Chinese government could just wipe them all out and replace them with another, more loyal city just like that. Ningbo (宁波) is looking pretty good right now. Population 7.6 million. Port city. Only a few environmental protesters a few years ago. Nothing like this. Real-Americans are learning the proper way to deal with childish uprisings. Ferguson demonstrated that martial law and further brutality is the best way to have a meaningful dialogue. After all, what did Ferguson protesters actually achieve? Or the Arab spring? We’re still at war with the Middle East. Is Syria any freer? Or Egypt? Things haven’t gotten any better for anyone, and they never will so you should just never protest ever. This shouting at the Great Wall by Hong Kong’s democracy lovers is just going to have that wall crumbling down on them. And you know: No one squelches protests like the Chinese government. The last time anyone came close? Tiananmen Square. We all know who won that. That didn’t change anyone’s mind. Forbidden Cities and Great Walls: These weren’t just designed to keep people out. They were also meant to keep people in. There is no point in protest here. There are no heroes there.